In the final book of the New Testament Bible, the Book of Revelation; we find perhaps the least understood and the most confusing and fought over book in the entire Bible. It is called the Apocalypse, which does not mean the end of the world as many believe. The Greek word Apocalypse means an unveiling of that which is hidden (A Revelation). It is a book credited to a writer named John, more than likely NOT the John of the other John in the Gospels of the Bible, and perhaps - this book may have even been written by a female author. It is an esoteric book of high symbolism and deep allegory. It is NOT a prophecy of a future literal history as is believed by so many. It is not prophecy of a literal second coming of Jesus, a rapture, and 7 years of tribulation. This is metaphor and imagery. Signs and symbols of transformation within each of us. There is within the black and white text of scripture, deep spiritual ancient Wisdom being revealed. 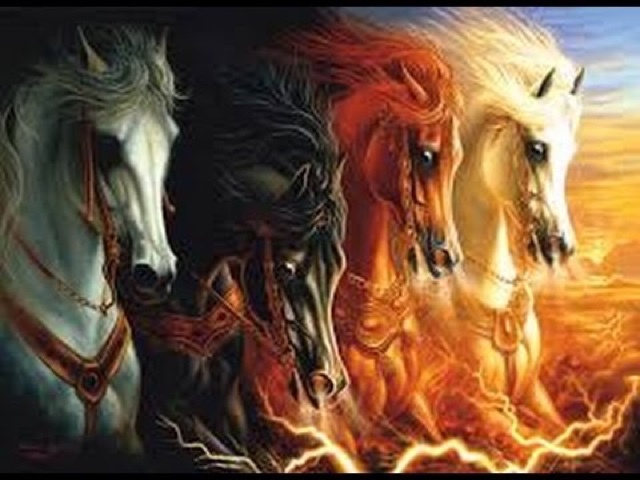 Today, we will talk about the Four Horses and their symbolism. The WHITE HORSE (Spirit) represents your spiritual nature. Unfortunately, the Rider trying to break him is religion. For the most part, the White Horse has wandered off of the path that leads to light, and gallops along carrying you deeper and deeper into the nightmare that is organized religion. The RED HORSE (Emotion) is your emotional nature. The Red Horse should be following BEHIND … so that the BLACK HORSE - representing your intellectual nature - can make decisions based on right or wrong, and NOT on emotions. But generally, what happens is that the Red Horse rears up and charges, and your emotions take over, and get in the way of your ability to reason. The BLACK HORSE (Intellect) is your intellectual nature. The Black Horse is strong and can bring you much that is favourable, but generally it is overwhelmed by the strength of the Red Horse of emotions. The Black Horse also is easily misled, and we see this in the operations of government, politics, and organized religion. We try to base intelligence on what comes from politicians, and pastors, and our intellect crashes under the hoofs of the Red Horse, and ultimately … we are the ones who lose. The PALE HORSE (Physical) is our physical nature. The Pale Horse is the favorite of religion, because they look to control the physical. They take control of your mind through placing a belief system within you from an early age, and later further control your finances, by controlling your physical nature. Modern day religions promise great prosperity. They take, you give, they take, you give, and eventually … the Pale Horse is caused to become lame. So you are promised mansions in heaven, or to be saved from a lurking Devil seeking to devour you, or to be healed in some miracle service, or saved from the eternal fires of hell, etc. Fear and guilt based control. The Horses are symbolic. They are not real horses - they are the four aspects of human nature and we ride them every day. They are the four aspects of your nature which operate through your mind. The control center and our personality. The human personality operating through a closed and wired system in each human being and actually controls all of our actions, including our desires, our loves, our hates, etc. The Bible, as well as all Ancient Wisdom, scripture, hieroglyphs, scrolls, mouth to ear myths and fables, all hide within them much deeper teaching for those who have eyes to see, and those who have ears to hear. Among the ancients, there were the Outer Mysteries, reserved for those who desired a simple go-to-church on Sunday morning kind of following, and then there were the Inner Mysteries. The deeper Truths reserved for those initiates willing to commit years of study in the Ancient Mystery Schools. The Outer Mysteries were the “milk” that Paul spoke of. The Inner Mysteries were the “meat” that Paul spoke of. When the Inner meets the Outer, the transmutation or metamorphosis is complete and there is no turning back to the old ways. Divine meets man … and becomes the Christ. The Divine Spark of God/Source within all things of the universe. 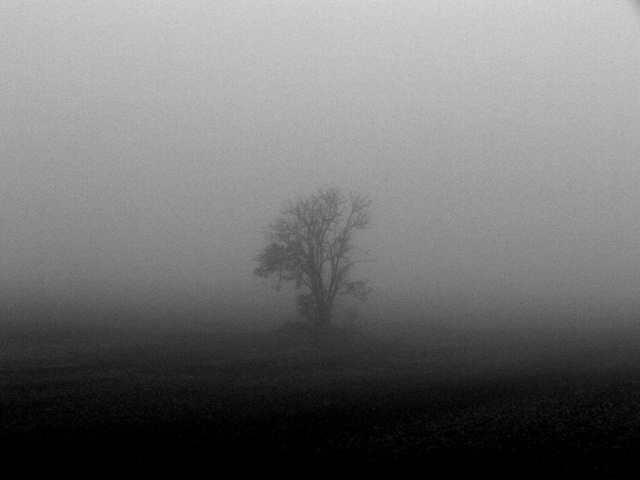 What Exactly Is Nothingness Anyway? God/Source Energy creates from Nothing because Nothingness, "ayin" in Hebrew, actually means absolute, infinite possibility. No limitations. No restrictions. None at all. Boundless ... and you and I are co-creators of this infinite potential. When you don’t need to be any particular something, you’re free to be anything. Kabbalah calls this infinite potential "nothingness" – not because there’s nothing there, but because there are absolutely no limitations that define or restrict this infinite possibility in any way. It is the place where all potential begins. Remember as we talk on this subject, think of the number Zero. It is a whole entire number ... it is something ... not nothing as is assumed. Just like Infinity is also a number. In fact, most everything in the digital world operates on zero's and one's. Zero, does not mean nothing. It stores the potentiality of numbers just like all the rest. As a human beings created in the image of the All There Is, you are also empowered to create something from nothing. And you do, all the time. Thoughts, are things (thinks) and will manifest into physical reality every single time. Thoughts are energy and cannot be destroyed. Unfortunately, most of the time what we create from nothing are the stories about what we can’t do, aren’t capable of, will never have – together with all the reasons why. This is ego blocking our natural spirit-led default program of abundance and endless potentiality. These stories are continuously being recreated from nothing in each of our lives. But unlike Source Energy, who creates consciously, we create this reality unconsciously. It’s a sort of default programming. Yes, I understand that you have reasons for what you believe, but those reasons, while they may help to explain your past, do not have the power to limit your future. Unless you think they do, and act accordingly. Most of us don’t wake up in the morning in awe of our own potential, in touch with our Divine purpose, filled with the joy of life, ready to create. More often we wake up conscious of our limitations, our disappointments, our frustrations, our unfulfilled needs, and the burdensome problems we need to solve. No wonder so many of us are worn out before we even get out of bed. Change your perception and the way you think, and you will change your reality. When everyone understands the power of this ancient Truth, the world will become a better place. We will be able to create love, compassion, understanding, peace, and tranquility for all creatures. Mind the gate of your mind ... you are the Watchman, you are the Observer, and you ... are the Creator.